So, it's been a little while since I last posted something, but I finally have a project to post for you! 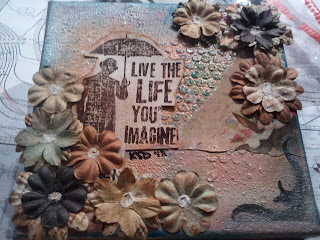 This is a little 6x6 canvas. For the background colors, I used Master's Touch Acrylic Paint in the colors Persian Red, and Flesh. The circles are made from Liquitex Modeling Paste. Next, I inked the paste and the edges of my canvas with blue ink. I mod-podged a piece of scrap paper from my stash. I also doodled the flourish in the right corner. I highlighted the corners of the canvas with silver ink. Next, I stamped a stamp by Tim Holtz on a piece of cream colored card stock, cut around it, and distressed the edges using Tim Holtz Distressed Ink in Tea Dye. Then I adhered it to the canvas. 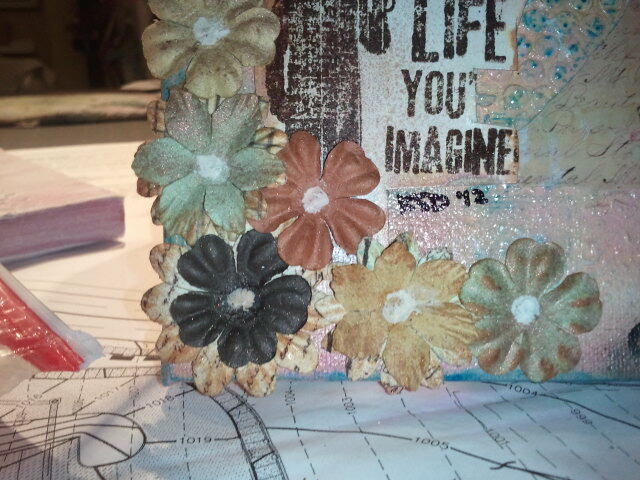 Now, I added some of my Prima Flowers. I misted them with a mist a made using FolkArt Metallic in Antique Copper. 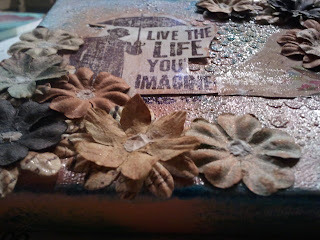 And of course, I distressed the flowers, too, with Tea Dye. And for the finishing touches! 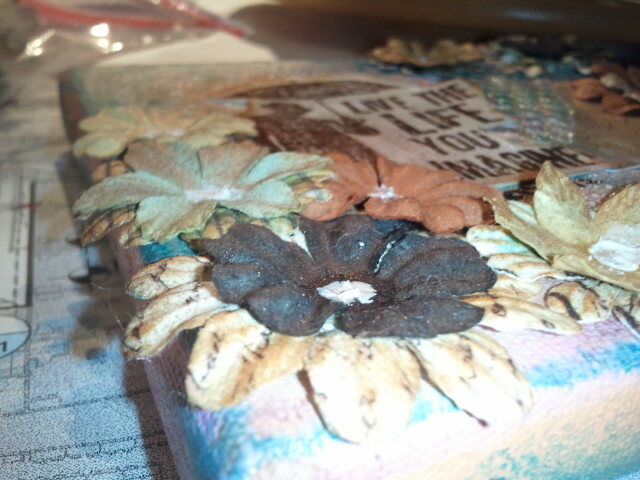 In the middle of the Prima flowers, I added little dots of modeling paste, to give the flowers more texture. I had lots of fun doing this little canvas, and I hope I inspired you! This canvas turned out really beautiful. I love the soft color palette you choose and all the little details you added. Thankyou so much! 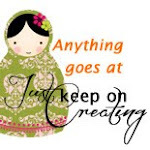 Nothing compared to the magic you work!